Can you believe this crazy mild weather we’ve been having in DFW this summer? In addition to very mild temperatures, we’ve also experienced extra rainfall and higher than normal humidity. What are all these conditions a recipe for? Well, fungal diseases of course! You didn’t think we were going to get off THAT easy with this weather did you? Due to the weather, we’re seeing an increased occurance of fungal diseses such as Gray Leaf Spot. 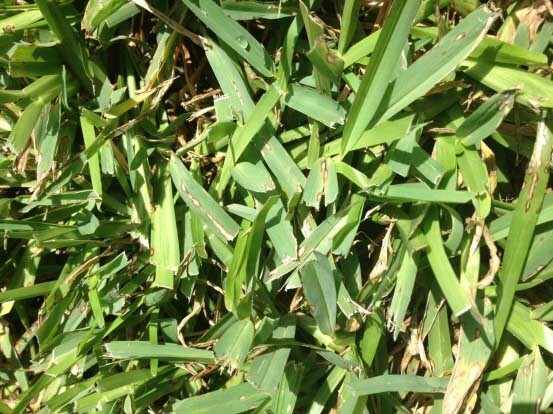 This disease can be identified by grayish-brown spots along the leaf blades fo your St. Augustine grass. Notice the long or oval gray lesions on the leaves. In time, the spots will spread and girdle the leaves of your grass, causing an a very visible overall brown cast across the entire lawn. Gray leaf spot needs moisture and heat to develop. Often we see this disease developing as a result of over-watering. During the heat of the summer, watering once per week is sufficient for a healthy lawn. Be sure to water in the early morning hours in order to avoid fungal diseases. Stressed plants and lawns are also more susceptible to pests and diseases. When plants have been subjected to extended heat, drought, compacted soils, poor nutrition or over-watering, they practically scream for insects and diseases to come in and finish the job. Strong, healthy lawns that have healthy soil, proper fertilization and watering will have a stronger immune system with which to fight off invaders. So what are the perfect conditions needed for Gray Leaf Spot to develop? Temperatures between 70 and 95°F are perfect for this fungus; but it then needs 14 hours of continuous moisture on the leaves in order to infect the plant. If you’re watering too often, or always watering at night when temperatures are right, you could develop problems in your lawn. Gray Leaf Spot is most common in new St. Augustine lawns that are being established and it can continue to be a problem in the first year. Why so? Well, if you think about it, new sod that has been put down must be watered frequently in order to survive and successfully root-in. All that excess moisture causes the problems. But, even established lawns that are being improperly maintained can develop the disease. Do you think you may have gray leaf spot in your St. Augustine? Contact us here if you are concerned about the health of your landscape.